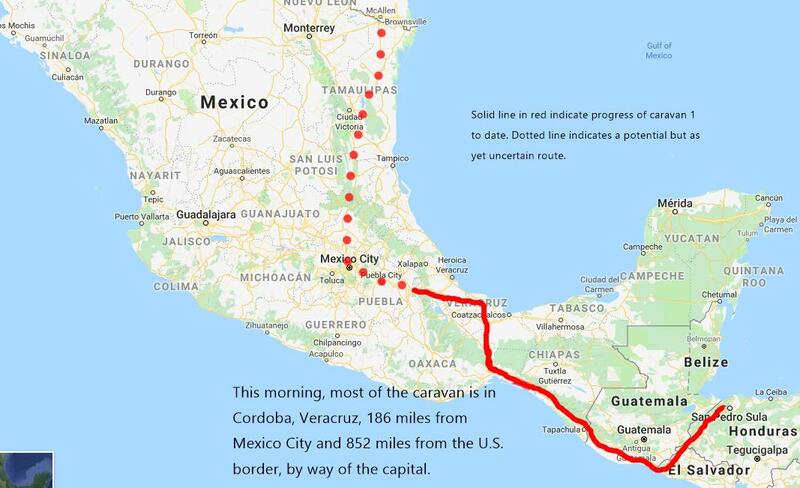 As we reported yesterday, the main Central American caravan (“caravan 1”) has splintered, with its component parts overnighting in various Veracruz towns and cities. Most spent Sunday night in Cordoba, Veracruz, which is 679 miles from the U.S. border by the most direct route. However, the majority seem to want to go by way of Mexico City, northwest of Cordoba. Sunday saw the most rapid progress yet, as the caravan, traveling by cars and trucks, covered more than 100 miles that day. Other members of the caravan spent last night in Puebla City, further up the road toward Mexico City, and about 450 made it all the way to the national capital itself. Mexico City is a convenient starting point to reach many destinations in the U.S., and the direction or directions the caravan will choose from there is uncertain. Again, no reliable news is currently available on the status and location of the other caravans.